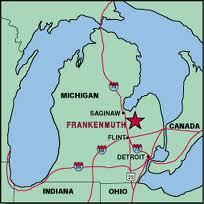 Frankenmuth, Michigan is a five hour drive outside of the city of Chicago. It may very well be the best five hour drive you could possibly experience at any time of the year, but it is beyond wonderful at this time of year. 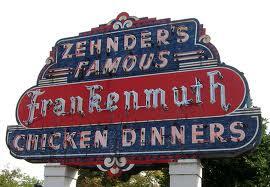 Frankenmuth was founded back in the 19th century by a group of German immigrants from Bavaria. It is Michigan's Little Bavaria. There are several tourist trap destinations around the country that have attempted to live up to its founding fathers, but Frankenmuth is a true stand out. Yes, Willkommen. It is a welcoming village on every level. The town offers a delightful and large bounty of unique shops, friendly hotels/bed & breakfasts, and a handful of good eating establishments. The Frankenmuth River Place offers 40 specialty shops and there is plenty of parking. The beautifully restored State Theater is a wonderful location to see films and the prices are from the 1970's. It has enough to keep children delighted for hours on end (yes, there is a water park and a ton of child friendly photo ops) and adults will find a solid fun-packed weekend with a beautiful bridge, lovely walkways and some decent fried chicken. Visit the St. Lorenz Lutheran Church (even if you are not Lutheran). It's a Gothic wonder built by the German settlers in 1880. Across from the church there is a replica of the original log cabin church. 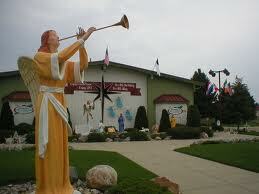 There are also two German cast bells which were brought to Frankenmuth in 1845. The highlight and the one overwhelming reason to go to Frankenmuth is a visit to Bronner's CHRISTmas (yes, this is the way it is written) Wonderland store. When I say it is "the" reason to go I do indeed mean it is "the" reason to go on this two day jaunt. 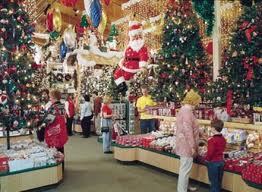 It is truthfully billed as the largest Christmas store in the world and you certainly will be filled with endless amount of joy, but bring your cash and credit cards. It took us five hours to go through the entire store. There are literally thousands of ornaments (50,000 or so), 500 Nativity scenes, a Christmas cookie cafe, hundreds of different Santas & Men Made of Snow; and a replica of Austria's "Silent Night" chapel. About 50 countries are represented with heritage on display from all across the globe. You name the image and there is an ornament to go along with that theme. Various other decorations are hung, strung and draped all over the store and don't forget the massive number of photo ops that await you on the outside of the store. I had my photo taken with giant Santas, enormous ornaments, mega-big Angels, stunningly beautiful Nativity scenes and a wide assortment of Snow People! 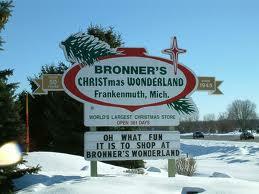 Bronner's is a Christmas wonderland! 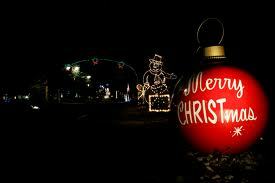 Enjoy Christmas! It's His birthday! Go to Frankenmuth! There is no way you could be disappointed. It is one of the best short-haul drives from Chicago.